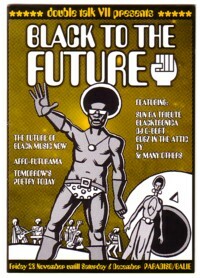 In 2003 there was a Black to the Future festival in Amsterdam. In the 60’s and 70’s there were, and there probably still are today, a lot of black musicians expressing their futuristic visions in their music. Sun Ra is the most famous Afro-futurist of course, but there is much more science fiction in black music. Once your eyes and ears are opened to this hidden dimension, you begin to notice it everywhere! 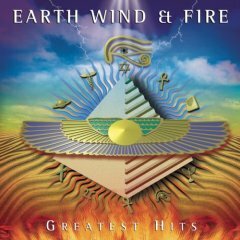 The covers of the Earth, Wind & Fire LP’s are a good example of how obvious things often go unnoticed. At least by me. Years ago i saw all these covers, hanging together on a wall in a record store, and that opened my eyes for the artistic message that these covers contain. I must have had them in my hands hundreds of times, but I never really realised that they are expression of an idea, somewhere halfway between science fiction and religion. Well, between November 28 and December 6 of 2003, there were at three locations in Amsterdam all kind of concerts, exhibitions, movies and discussions about Afro-futurism. I missed all of it, because I was on vacation. My friend Milan Hulsing made a few comic stories for the festival, that were published in a booklet, which all the visitors got with their ticket. The booklet has now become a collectors item, but I have three copies left for those who are interested. After the festival was over I never heard of the term Afro Futurism again. I expected at least that a few far out CD compilations would be released and that the genre would get its own department in record stores. But nothing happened. I still have to explain to my best friends that Afro-futurism is a totally overlooked musical genre. 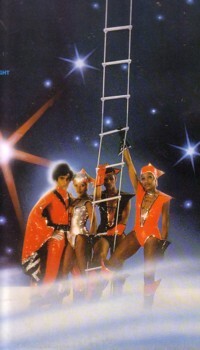 To demonstrate that Afro-futurism is not as obscure as it might seem, I choose a track from the LP Nightflight to Venus , by Boney M. The hitsongs on this LP are Rasputin, Rivers of Babylon and Brown Girl in the Ring have nothing to do with Afro-futurism, and it can be disputed if this actually a black band, but it is the title track that makes this pay-never-more-than-one-euro LP worth filing in your Afro-futurism section.